Hey Y'all! I hope this post finds you well! I have been dealing like it's Friday all day today. And then remembering it's only Tuesday and dying a little bit inside. Ok, Not Really. On the dying part. BUT, this week seems to be going especially slow! Whhhhyyyy? Maybe it's because of all of the exciting things I have on the horizon that seem to be taking forever to get here. One of those being Valentine's Day! 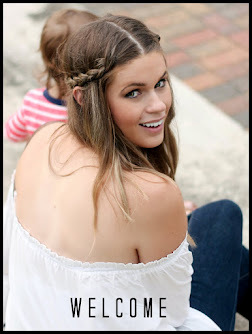 And then, just a few days later, Holland will be turning 2! (Oh my goshhhh, I feel so old. But that's another story.) Back to the Valentine's Day thing. With Holland's b-day being so close and the fact that my income is exponentially less than Jamy's I've always had to get a little creative when giving him gifts. Instead of focusing on big ticket items I try to pour all of my effort into the thought and the love that emotes from each gift. Now, I'm sure you have seen all of these ideas I am about to show you on pinterest or Facebook a million times. But, these are a few that I have actually tried and have been big hits with Jamy. The thing about cheesy, romantic gimmicks like these is that 'they are what you make them'. Sure every guy may not appreciate a dozen balloons as a gift but if you find a way to add your own personal touch to it, I promise it will pay off! You will look like the most thoughtful woman alive. So here are my tried and true DIY, Jamy approved, V-Day Gifts. That won't break the bank. SAY I LOVE YOU WITH POST IT'S! This is one that I did in the past that got me big points. When I did it the first time I probably used three times as many notes and put a lot more of our inside jokes and personal stories into it. But the general gist is to make a heart out of the many reasons you love him. The smaller, more detailed the reason the better, in my opinion. Make him realize that you really do notice all of the little things that make him great and he will get to start his day feeling like a million bucks. Women are not the only ones who enjoy getting pampered now and then. And you would be amazed at how many things you can make into heart shapes!! 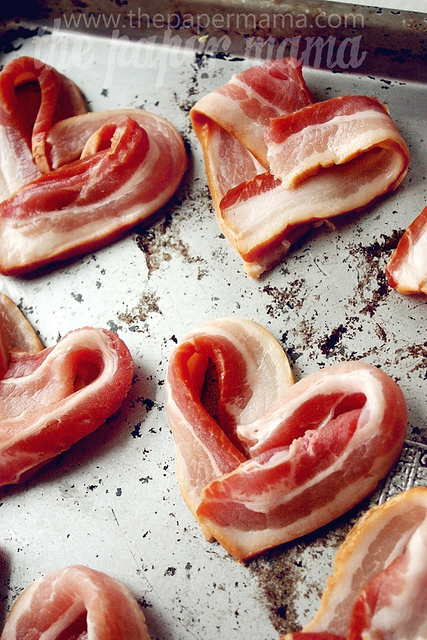 These little bacon hearts from The Paper Mama are super easy! Another one I've tried in the past are the cinnamon rolls that come in a can. you just unfold them and reshape them into hearts. Bake like you normally would and voila! Instant romantic man breakfast! Ok, so don't let the name of this gift throw you. It can be as sensual as you want or don't want it to be. When I did my version of this gift from What's On My Porch, I think I did, Sunglasses, Concert Tickets, Cologne, Back Massage and His Favorite Candy. And he LOVED it. Plus, it makes you look like you put a ton of effort and time in. Another fun idea is to take this simple teacher's gift idea from Let's Count Blessings blog and gear it to your husband's tastes. If your husband is as quirky as mine he probably has a million different little things that he would be stoked to get in a bag like this. Just think, if he goes into the gas station is there one little thing (candy, gum, drink) he always grabs? Or what's the one thing he always requests from the grocery store. Is there a favorite actor of his who has a movie out you can buy tickets too? The options are endless. Now, this is for sure my favorite because it's just as much for you as it is for him! You can plan out impromptu date nights that he can choose to cash in whenever, or you can make one for each month of the coming year. And the great thing is that they don't even have to be big elaborate dates. You can plan an awesome S'mores Date night like Emily did on The Small Stuff Counts! 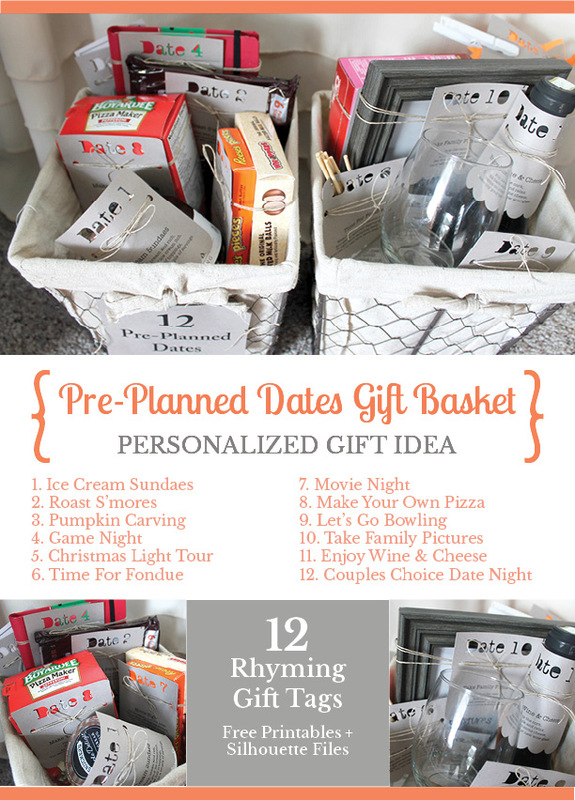 Awesome gift ideas!! I am going to try the "Favorite Things" idea for my husband! I love all of these ideas! 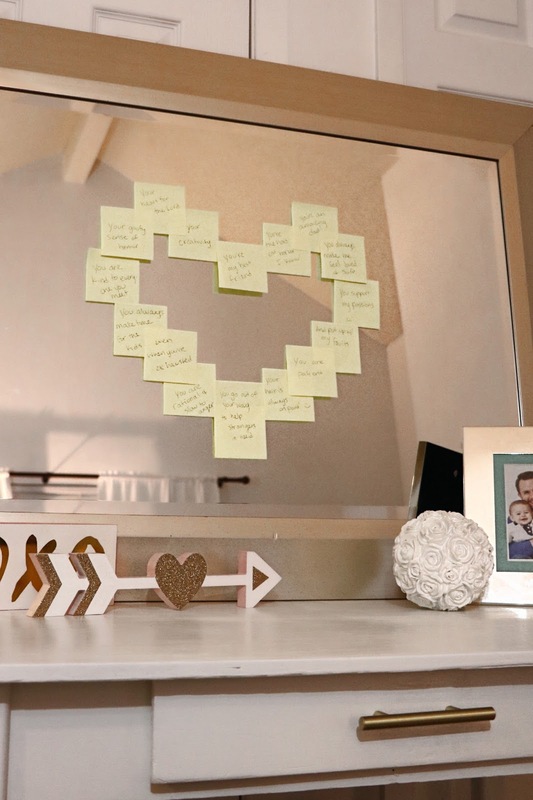 The post it notes heart is super fun! And the gift basket is perfect! I am all about doing anything with food. I swear to you food is my love language, so I will probably make him breakfast in bed because I know he'll really appreciate it! Great round up: I like the breakfast in bed and post it ideas the most! such cute ideas! i'm partial to the bacon!